A day after decommitting from UNLV, Bishop Gorman middle linebacker Nela Otukolo announced Monday he has committed to sign with Fresno State. Otukolo made the announcement on his Twitter page, just more than a week after he made a similar announcement about commiting to UNLV. Oral commitments, though, are nonbinding. The first day football players can sign a letter of intent is Wednesday. When the 5-foot-11-inch, 240-pounder committed to UNLV on Jan. 23, he canceled a visit to Boise State. After decommitting to UNLV, Otukolo, who led the Gaels in tackles with 121, narrowed his choices to Fresno State and Boise State. 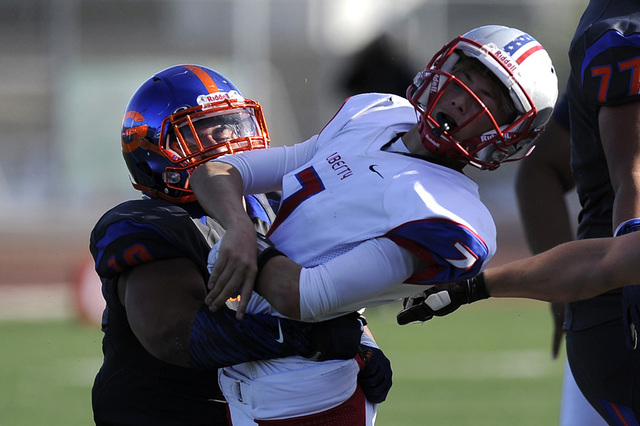 Gorman won its sixth straight state championship and finished 15-0 and ranked No. 1 nationally by USA Today. Before changing his mind, Otukolo was set to join his former high school coach Tony Sanchez, who was hired away from Gorman by UNLV in December.